Leftovers from these two dishes are commonly in the fridge at the same time. Here’s a way to bring them together in one tasty casserole. 2. In large pot, on stove, heat vegetable oil to medium-low and cook onion until softened. 3. Add cold gravy. Stir to liquefy and bring to simmer. 4. Add roast beef and frozen vegetables. Bring to simmer. 5. 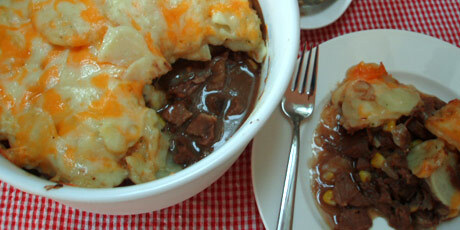 Pour into 2-quart casserole dish (deeper dish is preferred). 6. Spread leftover scalloped potatoes in even layer on top. 8. Bake on middle rack of oven 25 minutes, until bubbly at edges.